The origins of the word "monkey" are unclear. 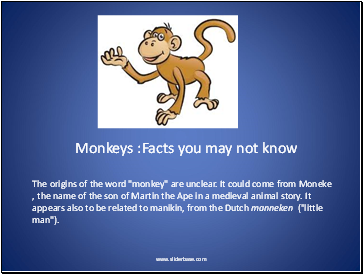 It could come from Moneke , the name of the son of Martin the Ape in a medieval animal story. It appears also to be related to manikin, from the Dutch manneken ("little man"). Monkeys are generally considered to be intelligent. The first monkey in space was Albert II who flew in the US-launched V-2 rocket on June 14, 1949. 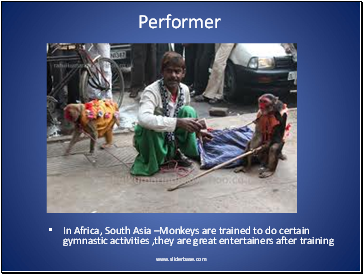 Monkeys are also used in various experiments as they are intelligent enough & pick up skills very fast . 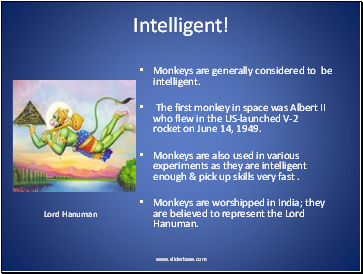 Monkeys are worshipped in India; they are believed to represent the Lord Hanuman. All monkeys like to be clean so they have a barber monkey clean out their fur. 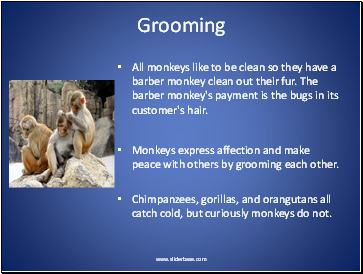 The barber monkey's payment is the bugs in its customer's hair. Chimpanzees, gorillas, and orangutans all catch cold, but curiously monkeys do not. A group of monkeys is called a "troop. 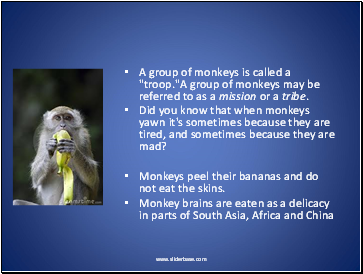 "A group of monkeys may be referred to as a mission or a tribe. Did you know that when monkeys yawn it's sometimes because they are tired, and sometimes because they are mad? Monkeys peel their bananas and do not eat the skins. 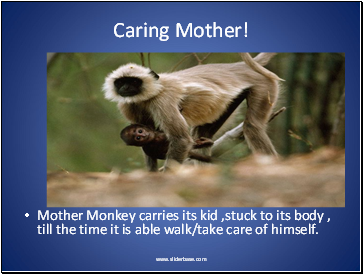 Mother Monkey carries its kid ,stuck to its body , till the time it is able walk/take care of himself. 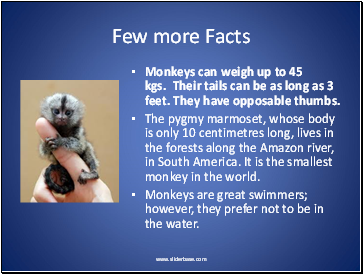 Monkeys can weigh up to 45 kgs. Their tails can be as long as 3 feet. They have opposable thumbs. The pygmy marmoset, whose body is only 10 centimetres long, lives in the forests along the Amazon river, in South America. It is the smallest monkey in the world. Monkeys are great swimmers; however, they prefer not to be in the water. 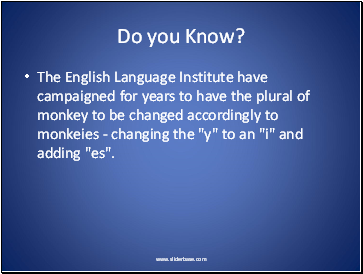 The English Language Institute have campaigned for years to have the plural of monkey to be changed accordingly to monkeies - changing the "y" to an "i" and adding "es".